As a special gift to his collectors, Robert Tonner created this one-time only head sculpt for his 15th Anniversary Convention. Don't miss your chance to add her to your collection. She has a 16" BW articulated Tyler Wentworth body and rooted raven saran hair. 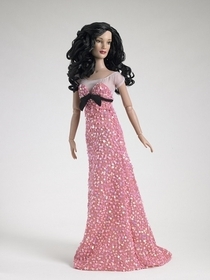 She's wearing a lined, pink chiffon gown embellished with micro-sized pink sequins and trimmed with a black chiffon bow. Also includes pink jewel and silver tone earrings; sheer pantyhose and strappy black faux leather and pink beaded heels. Display stand included. NRFB.